After working in the design industry for over 25 years, these were the questions I had started to ask myself. Running a design studio, I get involved with every aspect of the business and sometimes creativity is not top of my mind. And after spending so much time on everything other than design, I felt there was a danger of becoming rusty – of slipping into old solutions. In an effort to explore ways to be more creative, I needed to do something to provide some answers. Something to fire the imagination. But what? I like jazz. I’m not a musician, but I enjoy the music and it was while sitting at a couple of jazz concerts, I started thinking about how to express the music visually. The concerts were very different. One, a large band, upbeat, loud, expressive and fun. The other far more intense and thoughtful. Walking to work shortly after, an idea started to develop in my mind. 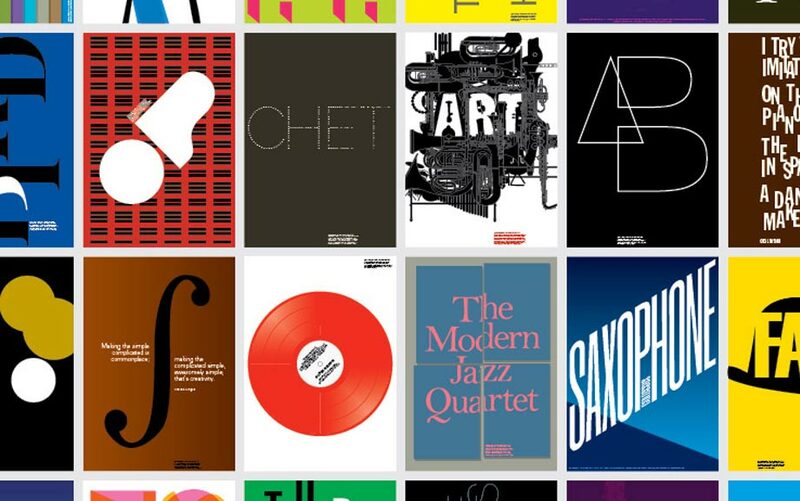 To develop a series of posters based on different musicians over a set period of time. But a few posters would not be enough. How about 100 posters, over 100 days, each one on a different musician? I compiled a ​‘top 100 jazz artists’ from various lists I found on web and then set about researching each musician and writing a short biog to go on each poster. Next I needed a creative brief. I kept it very simple – a visual, graphic response to the artist and the music and no photography. Keeping it graphic or typographic would be simpler and make it more challenging. Each day I would choose an artist at random – this way I would concentrate on one artist at a time. The aim would be to design a poster, pick the best solution (even if I wasn’t happy with it) and record my thinking about the process in a book. It was more about the process than the poster. I usually had about an hour or so each day. It was good fun and therefore made me want to explore creativity. Learning about each musician, their lives and their music, by systematically working my way through the list, it helped me discover far more music than I would normally do. It served as a great break in the day. It took me away from the usual routine of life that we so often slip into without realising it. Routine = same old solutions. I was slipping into patterns for solving problems. Certain ideas kept cropping up. When it was late in the day and I had little time, I would resort to tired and tested solutions. Rarely were they ever the most pleasing results. Recognising this helped push me into ways of developing other ideas. Listen to the music. This may sound obvious, but often we get carried away with getting on with the design and we forget that good research is essential. One day, when I had little time, I made the mistake of not listening to the music. The next day, when I finally did listen to a few tracks, I realised the design I had developed wasn’t right – I felt it didn’t reflect the music. Take a break. When struggling with an idea or design, the best thing was to just take a break and do something completely different. A little time away from the problem, doing something as simple as taking a walk often cleared the mind and led to the best solution or at least helped move the idea forward. Play. An important part of creativity is play and is not to be under-estimated. Giving the time to explore a subject, seeing what might happen and not worrying about failing, always led to a different way of approaching the problem. Starting from a different point got me away from tired thinking. This could be something as simple as trying a different typeface or using a set of colours I would not normally put together. Look for connections. Reading up on each musician, I began by looking for any connections and this could be anything from the music, name or life history. These connections often provided the initial idea, the starting point. The artist’s background and music then helped bring the idea to life. Concentrate on the distinctive. With so many musicians, to differentiate each one I tried to concentrate on what made them distinctive – the one thing that could only relate to them. This could be their name, a style of playing or an album. Sketch first and keep sketching. Listening to the music and sketching helped quickly formulate different approaches and concentrate on the idea. And not stopping at the first sketch is vital. By allowing the time to keep listening to the music, I kept sketching and didn’t stop at the first idea. Give it time and persevere. Whilst more hours does not always lead to more creativity – giving time to explore different ways of expressing the idea did make a difference. There was not always the time with this project to spend hours crafting the details, but when time was available it always made a difference. This article was first published in June 2014.